What makes the holiday season even more special? When a baby is on the way! How to you find a truly unique baby gift that will be cherished for years to come? What will the parents appreciate most of all? Should you buy something for baby, or treat the parents to something special? Holiday shopping is already tricky. And these questions only compound the anxiety of trying to find something perfect, because it feels like there's more at stake. We've created this holiday gift guide to show you how simple it can be to choose the perfect gift for the new baby and his/her family. We all know the baby gift market can be overwhelming. There are millions of things to choose from. But with a little bit of homework, you can quickly narrow down your options and choose something special that everyone will love. As the old saying goes, it's the thought that counts. The new parents will love any gift from you, so don't stress too much. No need to overthink it. Regardless of how close you are to the recipient—whether it's your twin sister or a pregnant coworker—nobody is expecting you to spend a ton of money or time on a gift. If you can wow them with something truly original, great. But if not, don't worry about it! Any gift will be appreciated. And besides, once baby comes, the parents will have a lot more important things to think about than who got them which gifts. Don't assume that every new parent wants the same thing. Each person in your life is different, of course. Each has different tastes and their babies are entering different life situations. One of the first steps to finding the perfect gift is understanding the couple you're shopping for: not just your relationship to them (friends, family members, neighbors, coworkers, etc. ), but what they actually like—and more importantly: what they need. What are the parents' personalities? Creative? Practical? Adventurous? You don't have to know the parents' personalities to get them a great gift, but it can help. For example, a creative person will likely appreciate something more artistic. Hiking? Sailing? Reading? Gardening? Incorporating a theme into your gift is a great way to show you truly know the people you're shopping for. This applies to gifts for both the parents and baby: for example, dancing-themed baby toys for babies with a dancer in the family. When in doubt, talk to the parents. How's the nursery coming along? Are they short on supplies? Are there essential baby-care items they aren't even thinking about? If there are items they need for baby (and maybe even can't afford), then forget everything else and get the necessities. Buying for first-time parents is generally easier, because they aren't yet equipped with the mountain of must-have baby items. If they do have kids already, it's important to consider the items they may already have. This is especially true for items like toys, books and other basics, like baby carriers. You may want to ask the parents if they have the item, before you buy. Wait! Do they have a gift registry already? If the parents are having a baby shower—especially if it's their first child—chances are they have a gift registry already. If you're not sure, ask. A gift registry is a list of items that the parents actually need and want. They've created it for a reason. Resist the urge to go "outside the box," thinking that the parents would appreciate something unique, or that the registry is too "boring." That's not how it works. If you have children yourself, then you know how crucial the registry is! There's nothing worse for parents when guests ignore their gift registries. When items on the list aren't purchased, it means the parents will be forced to buy them. So while a 10-piece set of baby bottles might not seem exciting to you, it's what the parents truly want. If there's no registry, you have more freedom to get the parents something more original. Finding unique baby gifts can seem difficult at first, but it's easier when you know where to look. Think outside the box stores: If you're shopping at Amazon, Wal-Mart and Target, chances are pretty good you'll end up buying the same gift as someone else. Consider specialty shops and sites instead, which tend to have more unique items, manufactured in limited supplies. Go handmade: When items are handmade, they are truly one of a kind! Handmade toys, crafts, decorations, blankets and other items are more special than something that's been built by machines in a factory. And the craftsmanship is usually better too. Give independent brands a shot: Sure, the big-name toy companies make plenty of great products, but a lot of those items haven't changed much over the years. When you choose smaller, independent brands, your options include lots of neat, original items that the parents probably have never seen before. Keep it practical. Originality is great, but make sure your gift has a function too. If it's a toy, will the baby actually play with it? Newsflash: newborns don't really do much; so at the very least, baby should be able to hold the toy and put it in her mouth! If you're buying something for the parents, make sure it's useful. Diaper cakes, for example, make great gifts because they're both original and practical: they bring smiles while helping the parents keep the nursery well-stocked. The great thing about a holiday baby is you have the opportunity to add a fun, festive spin to your gift-giving. If you can't find anything unique in stores, why not put something together yourself? You don't have to be a master crafter to make something special. One simple DIY gift is a holiday stocking filled with the essentials every new parent needs. It's better to go with consumable items, because parents never have enough. And no, you don't have to put all of those items inside—just a few to fill it up. The best thing about a holiday stocking is you don't have to wrap or decorate anything! 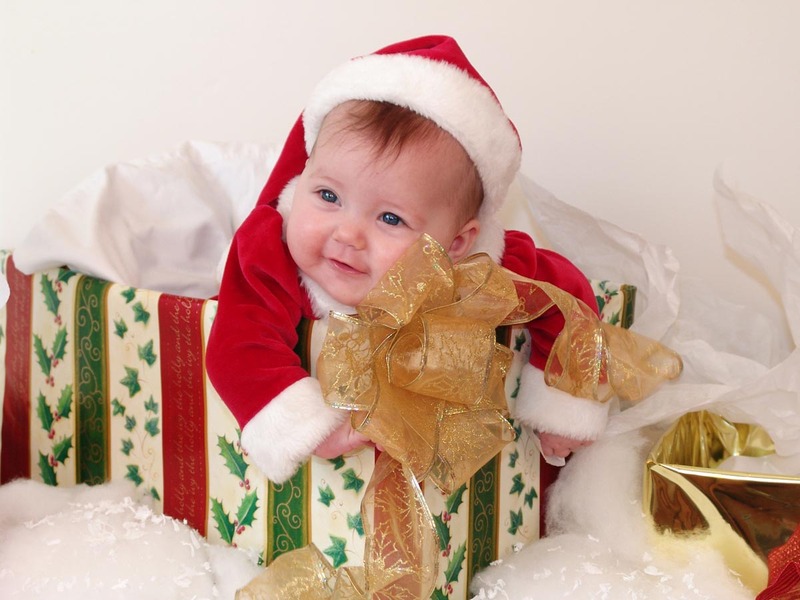 Just fit the items neatly inside, and you've got a festive, unique baby gift that the parents will love. But if you do want to add a personal touch, you can always add the baby's name to the stocking: just write it with some glue and sprinkle glitter on top. No talk of baby gifts is complete without addressing safety. If you don't have kids, or it's been a while since you have, you may not be aware of all the safety concerns. There are too many to list here, but ultimately, you just need to be sure your gift is age appropriate. No crib stuff for newborns: Don't bother with crib padding, pillows, bumpers or crib toys. All of these pose a suffocation risk and should not be placed in a baby's crib until they reach at least 12 months. Watch for choking hazards: Avoid small toys, Legos, Matchbox cars, anything that can fit in the baby's mouth. These items are choking hazards for older babies too. Be sure to check the recommended age before you buy. In addition to the "small" necessities like burp cloths, parents will need to purchase several expensive items for their new baby. You can help them out a lot, financially, by buying these items for them. Cribs, bassinets, travel cribs etc. Nursery furniture: dresser, changing table, rocking chair, etc. Just as one example, a car seat from well-known brands can easily cost a few hundred dollars these days (and the parents will likely need to buy another in a couple years as the baby grows). Important warning: if you do plan to buy one of these items, be sure to confirm it with the parents first. They may already have it, or someone else may already be planning to buy it. We know, we know … gift cards are "boring," especially during the holidays. But sometimes they're the perfect gift, especially for those with baby on the way! The truth is, most parents can't even fathom all the things they'll need for baby's arrival. Once baby comes, the parents will be spending more and more every few months, especially on consumable items, like diapers. A little extra cash can go a long way. If you can't find a unique baby gift, or don't have the time to search, go ahead and treat them to a gift card to their favorite places to shop. And if you're not sure which places those are? There's nothing wrong with cash either. Remember: whatever you give, as long as it's thoughtful, will be appreciated by the parents. Happy holidays and best of luck with your holiday shopping!